Maryland Poll Has Strong Support for Marijuana Legalization. A new Goucher Poll has support for marijuana legalization at 62%. Only 33% were opposed. The poll also had majority support for a $15 an hour minimum wage, the Affordable Care Act, and single-payer health care, and 71% disapproving of President Trump. Expect the legislature to try again to pass legalization next year. New Jersey Legalization Bill Almost Ready. A bill to tax and regulate legal marijuana commerce is "98% done," one of the state's leading marijuana advocates said Monday. Scott Rudder, head of the New Jersey CannaBusiness Association, said the remaining issue is whether to impose a 25% retail tax right away or to start with a lower tax rate that goes up over time. Gov. Phil Murphy (D) also expressed optimism about prospects for a bill. "I continue to believe it’s this year," Murphy said. "Doing it is important but doing it right is more important and that’s going to be key." Legislative leaders have vowed to get a bill to Murphy's desk by the end of the month, but the clock is ticking. Senate Passes Opioid Bill. The Senate on Monday approved legislation aimed at addressing the opioid crisis. The Opioid Crisis Response Act of 2018 (S.2680) The bill includes provisions increasing scrutiny of incoming international mail, eases the way for the National Institutes of Health to speed research on non-addictive pain relievers, allows the Food and Drug Administration to require pharmaceutical companies to package smaller quantities of opioids, and creates new federal grants for treatment, training emergency workers, and research on prevention. Funding for the anticipated spending will have to be provided in separate spending bills. The House passed its own opioid bill earlier this year. Now, congressional leaders will have to hammer out a compromise in conference committee. Drug Policy Expert Says Senate Bill is Not Enough. While the opioid bill referenced above authorizes $500 million a year in grants states will have to compete over, the amount is well below the massive outlay of funds used to combat the AIDS crisis in the 1990s, and the Congressional Budget Office found that the bill would be revenue-neutral. That irked Stanford psychiatry professor and former Obama drug policy advisor Keith Humphreys. "How much money was Congress willing to spend on the worst opioid epidemic in US history? None," he said. "Given that there was no consensus in Congress in favor of a really big investment such as we employed for AIDS, the two sides did the next best thing, which was agree on many second-tier policies that were smaller bore," Humphreys said. "There are good things in the bill that will save lives, but it will not be transformational." 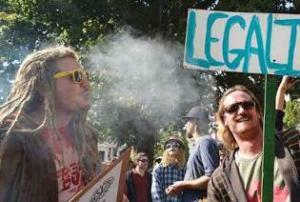 South Africa High Court Legalizes Marijuana Possession. In a case brought by three marijuana users who argued marijuana prohibition "intrudes unjustifiably into their private spheres," the country's Constitutional Court on Tuesday ruled that the private possession, cultivation, and consumption of marijuana is legal. >"It will not be a criminal offense for an adult person to use or be in possession of cannabis in private for his or her personal consumption," Deputy Chief Justice Raymond Zondo wrote in his ruling. It will, however, remain illegal to use cannabis in public and to sell and supply it. The ruling did not set allowable quantities, with the court saying parliament had two years to come up with a new law that reflected the ruling. Thousands of predominantly poor and black South Africans are arrested for marijuana offenses each year. Previous: Will Denver Be the First Place in America to Legalize Magic Mushrooms?